Brad Booth takes us on a tour of the OFC 2019 demonstration conducted by the Consortium For On-Board Optics. The COBO booth featured for the first time a 14 vendor ecosystem of COBO compliant products, including the world's only 12.6T Switch with multiple optical connectors. SK Telecom has applied a Quantum Random Number Generator (QRNG) developed by ID Quantique of Switzerland to its 5G authentication center (AuC). QRNG is a device that constantly generates “quantum random numbers,” which creates strong keys that are not biased and cannot be predicted. SK Telecom said it plans to apply the same quantum random number technique to its 4G network as well. Next month, SK Telecom will also apply ID Quantique’s Quantum Key Distribution (QKD) technology to the Seoul-Daejeon section – the most data traffic-concentrated section in Korea - of its 5G and LTE networks, to strengthen the security of 5G and LTE data transmission and reception. QKD provides ultimate cryptographic security based on the laws of quantum mechanics. It enables two parties to produce a shared random secret key known only to them, which can then be used to encrypt and decrypt messages. SK Telecom invested US$65 million in ID Quantique in February 2018. SK Telecom also noted its pivotal role in global standardization of QKD and QRNG technologies at ITU-T. In February 2019, SK Telecom’s two new technologies related to QKD have been selected as work items by ITU-T’s Study Group 17 (SG17), which coordinates security-related work across all ITU-T Study Groups. Combining these two work items with the two on-going work items on QKD and QRNG technologies it proposed in July 2018, SK Telecom is currently leading a total of four meaningful work items in SG 17. In addition, Sim Dong-hi, a delegate from SK Telecom, is serving as associate-rapporteur on quantum technology in SG17. SK Telecom has disclosed that its custom Mobile Edge Computing Open Platform cuts latency by up to 60% when deployed at a 5G base station. The carrier says Mobile Edge Computing (MEC) technology will be widely used for services that require ultra-low latency such as AR/VR services, cloud gaming services, autonomous driving & fleet management, real-time live broadcasting. SK Telecom also plans to open its 5G MEC Platform to allow its enterprise customers to offer related services. The company will provide open Application Programming Interfaces to enable companies to easily develop MEC-based 5G services. Through APIs, developers will be provided with diverse data and functions. MobiledgeX, the independent mobile edge computing provider founded by Deutsche Telekom, announced an agreement with SK Telecom to enable a new generation of connected devices, content and experiences, creating new business models and revenue opportunities leading into 5G. MobiledgeX is focused on delivering developer-facing edge cloud services and bringing mobility to those services, dynamically placing application back-end as close to mobile devices as possible and removing them when not needed. MobiledgeX, Deutsche Telekom and Intel have partnered with Telecom Infra Project (TIP) to form an Edge Application Developer project group to ensure the gained insights and supporting source code are available to all. Deutsche Telekom created MobiledgeX as an independent company to drive strategic collaboration across the world’s leading telecoms, public cloud providers, device makers and the surrounding ecosystem - enabling a new era of business models, operating efficiencies and mobile experiences. We are particularly excited to announce SK Telecom’s participation in this collaborative ecosystem where everybody wins. SK Telecom is a global leader in 5G which follows their rich tradition of innovation within their network, strategic partnerships and developer engagement. This new era is underway,” says Eric Braun, Chief Commercial Officer of MobiledgeX. SK Telecom and Samsung Electronics completed a network device interoperability test based on Dual Connectivity technology that used both 4G and 5G networks provided by Samsung's Networks Business. The test, which was carried out at Samsung Electronics located in Suwon, Korea, used Samsung's commercial 4G and 5G NR end-to-end networks solutions which have been provided to the operator's current service. In addition, companies used Samsung's virtual core (vCore) that supports simultaneous 4G and 5G as well as its Galaxy S10 5G, Samsung's first 5G smartphone which was unveiled last month. SK Telecom calculates that it will be able to boost the overall transmission data speed by 80% by leveraging the 4G and 5G dual connectivity. Dual connectivity is also known as 'E-UTRAN New Radio Dual Connectivity (EN-DC)' based on the 3GPP 5G New Radio (NR) standard. Orange has completed the migration of the Orange Long-Distance network to a new photonic control plane developed by Nokia. Orange says the migration, which involved distributing network intelligence to different equipment, was implemented successfully without any impact on Orange’s customers, after several months of preparation. During this time, the entire long-distance network (over 18,000 km and 330 nodes), was simulated. Orange’s French, European and Asian networks are underpinned by the Nokia 1830 PSS WDM platform, which can transport up to 20 Tbps over long-haul distances. These platforms have now been switched to software-managed operations, allowing the deployment of on-demand activation services and automatic recovery control via Artificial Intelligence technologies if there is an outage. NTT DOCOMO announced an equity investment in cloud gaming pioneer Hatch Entertainment Ltd, provider of the world's first made-for-5G game streaming service in Finland. DOCOMO has begun supporting Hatch's game streaming service in Japan, effective February 13. Going forward, DOCOMO and Hatch plans to leverage the extra-high-speed, large-capacity, low-latency and massive-device connectivity of 5G for gaming. DOCOMO plans to launch its commercial 5G service in 2020. Approximately 4 billion connections worldwide are now LTE, representing 47% of all cellular connections, according to the trade group 5G Americas and Ovum. 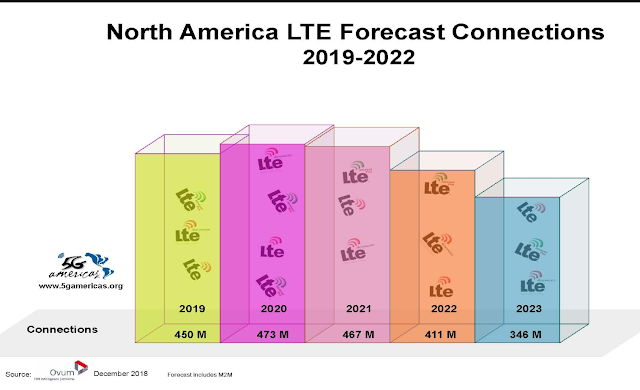 North America’s market share for LTE at 82 percent exceeds all other world regions at the fourth quarter of 2018; the next highest world regions are Oceania; Eastern and South Eastern Asia with LTE share of 67 percent followed by Western Europe at 52 percent. Latin America and the Caribbean had significant growth of LTE market share to 40 percent, up from 29 percent at the end of 2017. Market share represents the percentage of mobile wireless connections that are LTE technology versus all other mobile cellular technologies. “While the 5G market reality and innovation are upon us, the number of LTE connections continue to grow on 637 commercial networks worldwide, as well as the evolution to advanced LTE networks for the Internet of Things, Gigabit LTE speeds and new methods for spectrum use and sharing,” stated Chris Pearson, President of 5G Americas. LTE achieved 417 million connections with a market share of 82 percent in the U.S. and Canada. LTE penetration passed 100 percent in 2018. This penetration rate is forecast to rise to 125 percent in 2021 after which time new 5G connections will begin to impact LTE subscriptions and penetration rates. Penetration rates represent the number of connections compared to the population. LTE’s market share increased from 17 to 29 percent year-over-year at year-end 2017, and grew to 40 percent by the end of 2018. LTE is forecast to be the most widely used cellular technology in the region by the end of 2019. At the end of 2018, global LTE connections reached nearly 4 billion. Also notable, LTE market share reached 47 percent, up from 37 percent at the end of 2017. QTS Realty Trust, which operates more than 6 million square feet of owned mega-scale data center space throughout North America, will deploy Ciena's Waveserver Ai platform to support growing bandwidth demand and meet wire-speed encryption requirements for highly secure in-flight data protection. This deployment will also support QTS’ recently announced Switchboard interconnection platform, which enables self-service ordering and fast, one-to-many provisioning of local, metro, carrier, long-haul, and cloud services via a single port. “Our customers require quick access to network capacity and flexible interconnection services that are cost-effective and capable of protecting sensitive information. 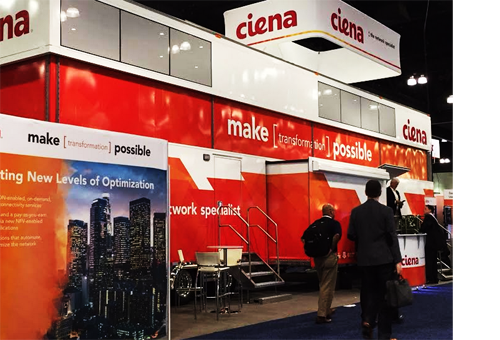 Ciena’s Waveserver Ai platform solidifies our mission to serve the current and future needs of our hybrid colocation and hyperscale customers while protecting their critical assets,” said Clint Heiden, Chief Revenue Officer, QTS. “As QTS continues to advance its connectivity strategy through the Switchboard platform, Waveserver Ai’s ability to meet evolving network use cases will support current and future interconnection requirements,” stated Jason Phipps, Senior Vice President of Global Sales and Marketing, Ciena. 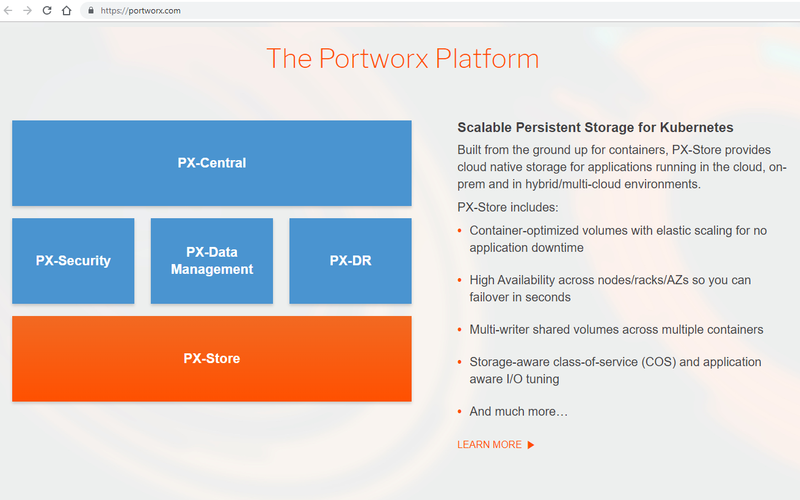 Portworx, a start-up based in Los Altos, California, announced $27 million in Series C funding to support its cloud-native storage and data management solutions. 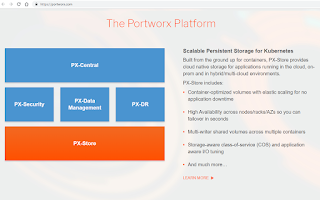 Portworx reduces storage, compute and infrastructure costs for running mission-critical multi-cloud applications while promising zero downtime or data loss. Major customers include GE Digital, Lufthansa Systems, HPE and thirty members of the Fortune Global 2000 or federal agencies. The oversubscribed funding round was co-led by Sapphire Ventures and the ventures arm of Mubadala Investment Company, with support from existing investors Mayfield Fund and GE Ventures, and new financing from Cisco Investments, HPE, and NetApp. The company has raised $55 million to date.